Imperial Squares takes advantage of the many geometric concepts introduced architecturally in both the exterior and interior of the Imperial Hotel. 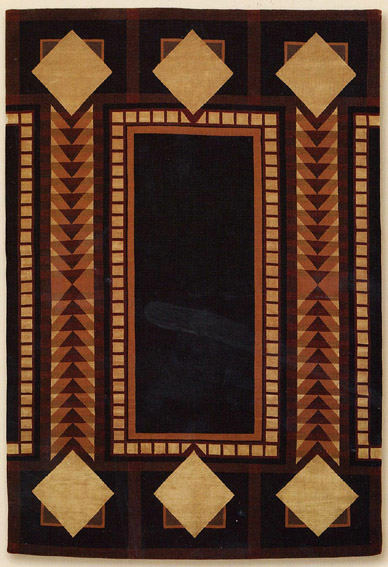 This finely woven wool carpet has silk insets to enrich and enliven the square, diamond and pyramid configurations. The shimmer of the golden natural silk against the deep chocolate brown emphasizes the colors in the design devices. Note the square border which surrounds the center and is again partially repeated vertically on both sides, evoking the feeling of an infinite repeat.